For this one, I am going to have to begrudgingly give the offending perpetrators some credit. While most of us are relaxing and sleeping in on our vacation, there are a dedicated few who wake up at the crack of dawn just so they can go to a resort’s pool and put their stuff on lounge chairs. This is not just a WDW “thing” as I also witnessed it on the Disney Cruise Line (especially on sea days). Now, there are signs everywhere that specifically say you can’t do this, but finding a Cast Member who enforces this rule is rarer than seeing a working Yeti at Expedition Everest. 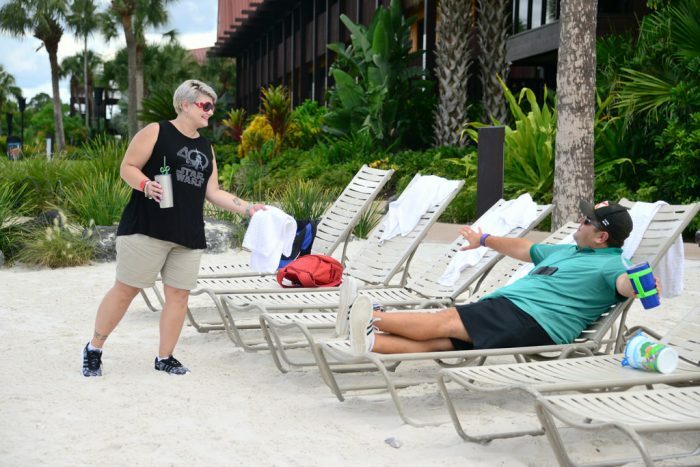 A walk around any WDW pool will show a sea of reserved lounge chairs, many of which are being held for family members who don’t even end up going to the pool. How to solve this may be tricky, but as a Floridian I think I have the solution. Because the state of Florida doesn’t require cars to be inspected, you’ll never go a day on the highway (or I-4) without seeing a car just left on the side of the road. Generally speaking, if you leave your car on the side of the road you have about two hours before it is towed by the state (at your expense.) Disney could have Cast Members “patrol” the pool area, taking notes of chairs which have clean, folded towels reserving them. If a guest doesn’t come back to the chair within, say, 30 minutes, the towels are picked up and the chair goes back into rotation for guests who are actively looking for one. I will concede that for the average guest at WDW, ebay pirates are probably generally low on the list of grievances. As someone who writes a monthly merchandise report, it is an issue that sticks in my craw. Any time there is a hard ticket party, a “celebration,” or any event in which Disney puts out exclusive merchandise, the eBay pirates swoop in like buzzards picking the carcass of a dead animal. They hoard park maps, pins, shirts, and anything else they can quickly flip on eBay. In a brazen move, there are reports of these scoundrels actually flipping items to other guests while inside the parks! 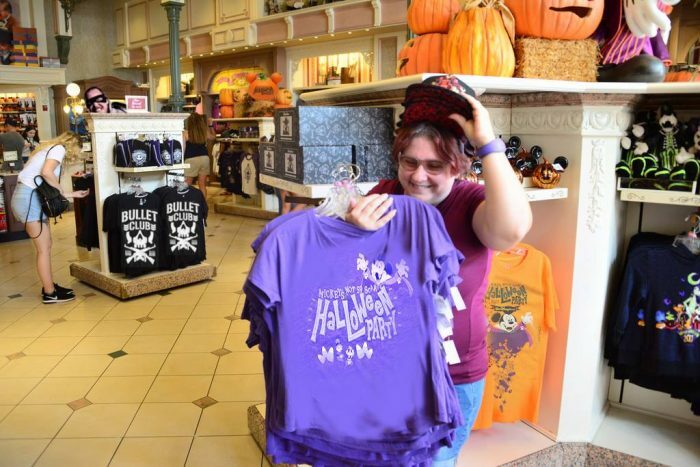 In the past year or so, Disney has made a half hearted effort into trying to curb this problem by instituting buying limits (2 per day for some items, 5 and 10 per day for others) but the pirates get around that by working in teams. There really is not much Disney can do other than just producing higher quantities of the “limited edition” merchandise and making it easier for people not at the parks to purchase (such as the Shop Disney Parks App.) Meanwhile I’ll just take an extra dose of Xanax, chant “Serenity Now” and try not to let the guy carrying 20 Cinderella carriage popcorn buckets drive me too crazy. Truly one of the most amazing accomplishments in my lifetime is how much America has reduced smoking in public. When I was growing up, they were still allowing smoking inside airplanes, but now it is almost odd to be somewhere that actually permits smoking. 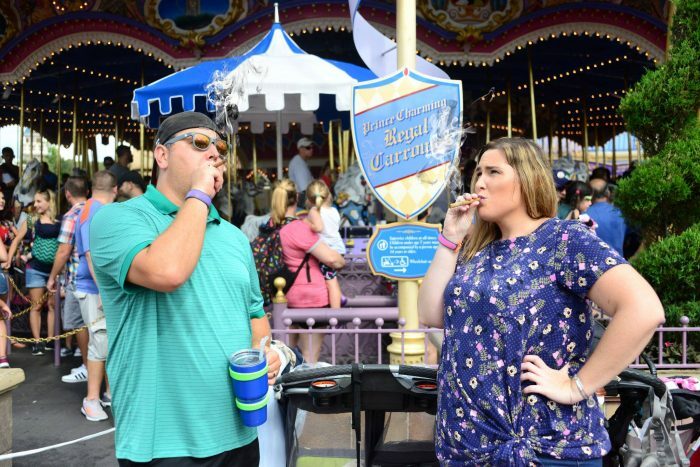 The Disney Parks are one public place where you can find people smoking, in designated areas generally away from anything us non-smokers would want to be around. Some guests don’t feel the need to actually go to these areas, and instead light up wherever they want. It never fails. You’re walking up Main Street USA at the Magic Kingdom and you almost run into a group who decided to stop in the middle of their tracks to have a conversation. Bonus points if this happens during a busy time and it’s in an even more inconvenient place, like a sidewalk. 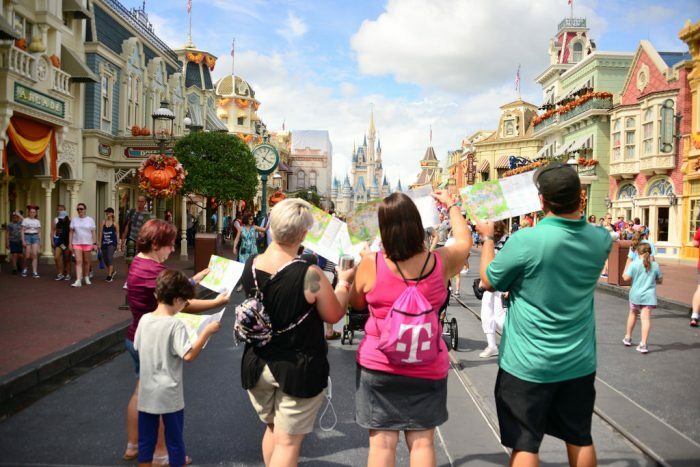 Walking etiquette just does not exist at the Disney theme parks. Stroller convoys going side by side not allowing anyone to pass, yet walking at a speed that would make Disney Construction say “maybe we could go a bit faster here, what do you think?” Nothing tops the people coming to a dead stop in the middle of walking, apparently having decided that RIGHT NOW is the perfect time and place to have that family conversation about tomorrow’s dinner. I am going to start a Change.Org petition asking Disney to create “park jail.” Like a brig on a sailing vessel, this would be a place where we could keep guests in Time Out for offenses that ruin the theme park experience of others. Not saying keep them in there all day, just for the amount of time guests around them had to wait in a queue only to have their ride ruined by some jerk taking flash photos. Give them some time to think about what they have done. On the walls on this prison cell holding center we can even put blown up pictures that were taken in dark rides by people using flash to show them THAT THE PICTURES LOOK HORRIBLE ANYWAY. The Seas with Nemo & Friends as it should be seen. The exact same moment if sitting next to someone taking flash photos. Not only is it distracting to everyone near the offending party, the obtrusive light reveals things that take away from the immersive story. Alright fellow men, for this one I’m looking directly at YOU. No one is better at transportation than Disney. There are so many incredible ways that we can get to and from the parks and hotels. Many times we can enjoy the rides on the various boats, busses, and monorails without a care in the world as there is generally a lot of space to go around. Sometimes though, the busses and monorails can be standing room only. In those cases you will invariably find some goof taking up too much space and – even worse – not offering up his seat to an older person or family who has their hands full. 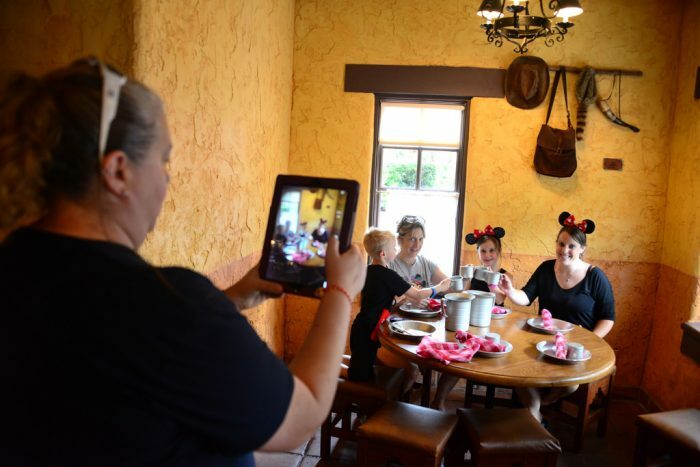 The only thing I can account for guests using tablets to take videos and pictures in the parks is they must think “bigger is better.” They must not realize the camera in their phone is much better quality than the one in their tablet, nor how crazy they look holding these monstrosities up. This is even better to see in WDW shows with a couple people in front of you holding up large iPads to film the show and their screen is so bright you are naturally drawn to that instead of the actual show on stage. 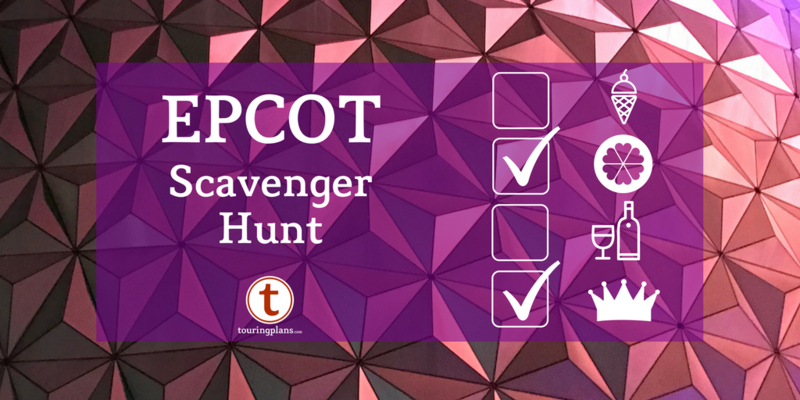 So there you have it: A SATURDAY SIX Investigative Report on Disney World Pet Peeves! See you next weekend for the latest installment of the SATURDAY SIX, where we’ll look at something fun from the world of Disney and Universal. If you enjoyed yourself, be sure to check out The Magic, The Memories, and Merch! articles, or, for your listening pleasure, check out the E-Ticket Report podcast. You can also follow Your Humble Author on Twitter (@derekburgan). Is something happening on the stage? Special Thanks to crack staff photographer Brandon Glover, master photo manipulator Matt Cleary, “Professor” Daniel Miller of Drunk@Disney fame, the long suffering Carrie, Orlando Everyday‘s Caitlin Dineen, the intrepid 3 O’Clock Parade news team correspondent Ellen, Jammin’ Julia Mascardo, Tim Grassey of WDWThemeparks.com, and blogger to the stars Megan Stump for their invaluable assistance with this article. Be sure to also check out Brandon on The Park Blogger podcast with goofballs co-hosts Aengus Mackenzie and LitemAndHyde , while fellow Potterheads may enjoy Meg’s work on the Central Florida Slug Club. But number four. Don’t be in or near my ride vehicle and do that. Ever. You will never, ever forget you were. That’s when school-marm me turn’s right back into native New Yorker me. I have chewed out people either during or immediately after the fact. Like, mouthy New Yorker, try not to get myself thrown out of Magic Kingdom, loudly chewed up and spit out and OMG they’ll never take another flash photo on Haunted Mansion again. It’s a dirty job, but somebody has to do it. I could have used you on our August trip on Big Thunder Mountain. Used a fastpass to ride it at night for a special effect only to have the guys in the front seat do a video-selfie for the entire ride, blinding everyone else with the light! Because my son wasn’t keen on a confrontation I would have said a lot more than I did. Total disrespect for others and didn’t care one bit. If there’s any justice in the (Walt Disney) World, the Disney Police snatched that narcissistic jerk and he remains imprisoned on Pandora scooping up Banshee dung as punishment. Yep. Me, too. I don’t feel guilty for being rude to rude people. Although I do try to curb it if I notice their embarrassed kids desperately trying to disappear. How else will the rude people learn if we don’t humiliate them? LOL I have no problem speaking up if people are being flagrantly awful. How in the world is CUTTING IN LINE not on this list? I usually have fast passes, but on the becoming more common instances where I can’t get one to the more popular rides, my wife and I are sometimes forced to. On our last trip to Flight of Passage, a guy yelled at me, into my face, because I would not let him and his family of 9 cut me. Last time we waited for mine train, we were cut at least four times. By far, there is nothing that peeves me more. This is just Part One of a Six Part series. Don’t get me started on people who hold up lines at Quick Service Restaurants because they are A) flummoxed by a menu with five items or B) need to ask the Cast Member a thousand questions. This one can be tricky. If you have food allergies the process at quick service is that you have to get in line and talk to the cashier, who will then begin the process. Depending on the QS location this can end up looking like we are holding up the line when in fact we are following Disney policy. Just wanted to add that to the conversation. Traveling with a vegan, I have absolutely no problem with people with food allergies asking questions. My problem is with people on day 4 of the Disney Dining Plan asking what credit a cheeseburger counts as. One of the most fascinating moments of my times at Disney was at Guest Relations at Caribbean Beach and the guy next to me screaming at the CM because he felt wronged that a Table Service credit was used instead of a Quick Service credit at the Rainforest Café. His reasoning was that he chose to sit at the bar so it shouldn’t count as a “Table Service.” If you put this stuff in a comedic movie people wouldn’t believe it because it sounds so implausible. I really need a book of insane guest stories from Cast Members, the true heroes. My husband and son saw a family of 20 cut a line on the Buzz Light year ride. Park workers saw them and did nothing. Love the photos illustrating the article! Those photos helped me not to allow my blood to boil reading the article! Nice Bullet Club tshirt in Pet Peeve #5… but how ’bout some love for a true Disney fan like Alexa Bliss? Haha just spooted Repo Man. Demolition long overdue for the Hall of Fame. For me it is just the number of people who seem to be on some sort of mission barking orders like a drill sargeant to their unhappy looking families as they charge through the parks at the speed of me first. You’re on vacation aren’t you? Enjoy yourself and relax! My favorite was the drill sergeant in full force at 7:45 in morning at Kona Cafe BEFORE THE DAY HAD EVEN STARTED. It was so out of character for her that we’ve never let her forget it. This was spoken to a child who was poking around in the flowers at a mini golf while the other one was taking his turn, and didn’t immediately take her place at the tee. Looked to us like she WAS having fun – until she was yelled at. Not that I’ve done it more than once or twice (in situations of convenience), but I always assumed iPhones and iPads used the same cameras. Thanks for setting me straight and helping me not be one of those people! I will say the not giving the seat up a monorail thing is a double edged sword. People who have gigantic strollers, don’t break them down, and take their kid out and plop them in between parents is just as bad as the Dude Bro who insists on sitting as an elderly couple try to board. Deciding who actually deserves the seat is tricky. The woman in the picture should just wake that preteen kid and not think she deserves the seat. I do wish that people with children would hold them on the buses that would free up ALOT of room.My husband and I still sit our 11 year olds in our laps if the buses are crowded. It drives me crazy to see 3 and 4 year olds taking up a seat when there are other small children standing with no where to sit. I agree. My daughter is 10 and if the bus/monorail/boat is full, she always sits on my lap and always has in that situation. FYI…Those pictures were staged for the article. My kids have been going to WDW since they were in diapers. My son, now 11, melted my hear when he was around 8 years old. We boarded a Disney bus at closing so of course it was standing room only. He was sitting next to me and while I held his 18 month old sister. Another mom holding her baby got on the bus and my son, without me asking, kindly stood up and told her to sit. He refuses to sit when others have to stand. Me and my child waited in line for that seat on the bus or monorail no one forced you to get on when it was standing room only. Wait for the next one you want a seat you want to get where you are going or stand there and scowl be passive aggressively mad and let it ruin your whole day. This is such a common reply to the ‘giving up a bus seat’ debate. I totally understand where you’re coming from. However, have you never travelled on public transport? I have sometimes, and of course I’ve paid my fare and I’ve waited in line, whether for bus or train/tube. At busy times if I see anyone who needs a seat when there’s none available, I will give up my seat, and so will others. No one has ever said, “I’ve paid my fare and waited in line so I’m staying!” Well, maybe some have but that’s a jerky thing to do isn’t? Why any different at Walt Disney World? Depends on the 11 year old. My 11 year old is nearly the size of my husband and I and would be very awkward to have him on our laps. However I would happily stand so my kids could sit and not take up too much room. Unless, like my son, she is narcoleptic then “waking them up” is easier than it sounds. Yes!!! Exactly. Don’t judge and if asked, please give up your seat. Yeah, my sister let my 8 and 4 y/o nieces have their own seats on the bus back to Pop Century, but there were all kinds of adults standing…even me! She said she “offered” the seats to people, but she’s clueless enough to not realize that they were just being polite back to her. Stand the kiddos up and leave the seat open! Someone will take it! OMG, people/families who don’t understand that food-line registers with space on both sides means TWO lines and the cashier alternates between them. So they never form the second line. And then you get on the second line as they only person and immediately have your order taken. And they complain to the cashier. And she points out that it’s two lines and their heads explode. Or you tell the people in front of you that it’s two lines when the second one empties out and they refuse to get on it and make room for people behind you because they think forming a line as intended is rude. So you get on it and immediately have your order taken…and they STILL won’t get on it, so everyone BEHIND them flies by them into the second line. Yeah, I kinda feel bad doing that. Occasionally I will tell someone that “this side is open too” giving them a chance to get ahead of me, but rarely do they take the opportunity (probably feeling that I’m trying to trick them. Disney should probably be a little more clear about those lines. Especially since there is often a CM/Manager in the area they can alert people to that fact. Related, it drives me bananas when Disney CMs don’t make people use both Touchpoints at the “turnstiles” when entering a park So invariable one sits empty while the line backs up. I’ll jump up and check myself in while getting dirty looks from the family still waiting for their member to check in on the first Touchpoint. I’ve always wondered why Disney ever decided to implement this silly queueing setup in the first place. WDW is the only place I’ve ever seen it and few who aren’t park regulars understand it. Nice pic of Gov. Christie in the first one. I thought it was Island Beach for a minute. My number one pet peeve is definitely when, in a queue/loading area that is wide, and the CM asks guests to “fill all available spaces,” (and I DO, since I am a former attractions CM) and the guests that don’t listen shoot you death glares because they think you are cutting them. AHHHH. Happens all the time, especially in Haunted Mansion. I was so astonished at being spoken to like that, I couldn’t even come up with a response except that that’s what the CMs were telling us. Wow, I’m still mad about it and it was two years ago, haha. I’ll jump on the pet peeve bandwagon. In addition to flash photography, I would add lighted video screens from cell phones and tablets. Try riding in row 3 of POTC and the first two rows are filming the entire attraction with their screens on full bright. It’s as equally distracting as a flash, ruining the experience for all. I wish Disney would ban this. There’s nothing more distracting than a lighted phone. Go on you tube to relive your favorite ride…or just enjoy the moment. I could not agree more! I went with my family to Shanghai Disneyland and rode the Pirates ride there (which by the way is awesome!) and nearly every person on my boat had their cell phone on and holding it up on one of the times I rode it. It takes so much away from the incredible experience of the ride. People who record the entire fireworks show with their phone or even worse IPad drive me nuts. First because they’re usually blocking the view of others around them with the device and blinding people with the screen glare. And secondly because there’s no reason to record the fireworks. Your family isn’t in the shot and they’re the same every night. If you want to see them again go to YouTube and watch the exact show again filmed by someone with a better view and better gear. And don’t get me started on people filming video in portrait mode, but that doesn’t really impact me – it just means you won’t see much when you watch it. The best word I’ve heard to describe many of these transgressors is “obliviots”. People who wander through life oblivious to how their actions are negatively impacting others around them, or who don’t care. Yes! And it’s bad enough that people do this right in front of you. I actually had a woman do this OVER MY SHOULDER while standing behind me. That’s a big 10-NO. Grant it, she was shorter than I am, but still. She could have asked to stand in front of me and I would have obliged. I thought I was the only one who got ticked at the eBay crap. Now there is a monthly Disney box club that you can join and every month she happily displays her 4 yes 4 baby carriages full of stuff that she then ships off to others at a mark up. It’s not even just at the parks. My daughter wanted a Descendants backpack from the Disney Store for school this year. I didn’t order it when she first saw it and when I went back to order it, it was sold out. I found it all over ebay and Amazon for 2-3 times as much money. Even though my daughter was extremely sad and broke down crying, there was no way I was going to support that. I kept stalking the Disney store website and they got more backpacsk in and I bought her one. If they hadn’t, she would have just had to live without it though. If people wouldn’t buy from the pirates, they wouldn’t exist. What about the people that try and come up in front of you after you’ve steamed out your spot for a parade or fireworks show?! With no regard for you and the time you put in, they just weasel their way in front. Don’t forget that the person who steps right in front of you at the last minute will probably hoist their kid on their shoulders just to make sure that the view they didn’t personally block for you will be blocked by their kid. I’m astonished how often people do this! I’m disabled and there are a few things that people do that make the parks challenging for me. One of the worst things is that I transfer from my scooter to my cane to go into the bathroom because its easier to get around the crowds of people. Im clearly walking with difficulty, but most people walk straight at me, expecting me to go around them. Another is that people are constantly walking backwards into my scooter. The other thing is something that I wouldnt have realized until I became disabled myself. I have a great deal of difficulty getting into some rides, such as Matterhorn. When I look up into the queue I see a sea of pity faces staring back at me. I would have done the same thing before I was disabled. Now I know how awful it is to have people constantly viewing you with pity. I’m at Disneyland, and while I may be struggling, I’m having the time of my life. Smile! I noticed at Aulani they do claim to have a policy to prevent reserving chairs all day. I don’t remember exactly how long, two hours, maybe. I did see some cast members actually “put chairs back in circulation” but not often. It was still nearly impossible to get a chair near one of the pools in the family areas. Easier in the adult only section and no problem on the beach. Yes, Aulani is much better about it! CMs rotate through and place the towels on the back of the chair. Then, next time they go through that area, towels that are still on the back of the chair are taken and those chairs go back into the rotation. Change #1 to “ok able bodied adult” and I would agree with you. What does gender have to do with it? Nothing. I don’t judge men sitting I know plenty including veterans who “look fine” but need the seat more than most women myself included. I’m 57 years old and by outward appearances seem to be in good health. However, I have suffered from back issues for many years. Yet I always try to offer my seat to seniors and small children. But just as you said, at the end of a long day in the park, my back is often screaming. I still usually offer up my seat regardless because my pain isn’t visible. I’d be mortified if I thought anyone was thinking that I was a jerk for not giving up my seat. Short of wearing a sign around my neck explaining my circumstances, I think I always will continue to defer to others. I usually wait for the next bus if I have to stand. I recently needed a hip replacement. I also need a knee replacement. Prior to using a cane it was not obvious to others that I needed a seat. We often have given our seats up for others. Even after we waited for another bus my daughter has given her seat up. It is hard to stand for long periods at a time even with a cane. I wish they had benches for handicapped people who have to wait for the bus. This summer we were at the Animal kingdom and Disney springs and there weren’t any workers directing people. At Animal kingdom people kept cutting in front of us. At Disney Springs we walked all the way around to our bus only to find out they had changed it to the opposite end way back on the other side. They really need to do a better job of letting people know when they change things. I have told my daughter that I plan on bringing Nerf balls in a bag with ice water in order to throw them at people with flash cameras inside of dark rides. I’ve had it! They ruin the enjoyment for every person who has stood in line for up to two hours. Truly I just wanted take them by the neck. Maybe a wet Nerf ball will change their mind. Ive heard of the people that “secure lounge chairs” but I’m not sure how because MY pet peeve is the people that remove my stuff if I dare leave to check on my kids.Ive literally walked three feet to see someone rush my seat and try to take it. Flash on dark rides is a top five peeve for life in general. #1 in theme parks for sure. If I can reach the camera, I will immediately cover it and tell them to sell it. I’m not waiting an hour to see a painstakingly crafted visual illusion, for somebody who is watching it through their phone to ruin the experience for everybody. I’ll add in, people that stand in front of people who are sitting on the ground for parades/fireworks/etc. Understandably, there are people for whom it’s very difficult to sit on the ground, especially for prolonged periods of time, but in that case, it would be appreciated if they would choose to watch in a standing section, or at least from behind those who are sitting. I suppose I just don’t agree with the mentality that, if a family got to a particular spot first, they are entitled to disregard the enjoyment of the show of everyone who arrived after them. Particularly as a person who was usually in the parks alone, and didn’t have the luxury of having people stake out the ‘good spots’ while everyone else went off and did things. To the lady who wrote this. I agree with most of the the 6,but please stop with the a man should give up he’s seat because he is a man. I don’t tell you to stay in the kitchen, or wash those dishes because your a woman. If sexism is a problem for women then women have to stop it as well. That being said I was raised with manners and would give my seat up. I just don’t appreciate your stance on this topic. Where exactly are these so-called sitting sections for the parades and fireworks? Because 99% of the time, people will be standing, as they should be. There’s a reason cast members tell everyone to stand up before the fireworks start and that’s because it frees up more room and it’s a safety issue. As for the parade, the only places where you should be sitting are on a bench/wall (which isn’t the best viewing spot anyway) or up against the ropes. So unless you’re in some special VIP section with chairs specifically to watch the shows, people will be standing as they should be. Disneyland, in front of the castle. To be fair, it’s been a while since I’ve been there and I only ever staked out in front of the castle a couple times because of the excessive wait involved, so I may be misremembering about the fireworks. But there are definitely multiple areas along the parade route where people sit for several rows back from the curb. The flash photos on dark rides is my #1 pet peeve! I hate the tablets to take photos peeve, but not as much as that. 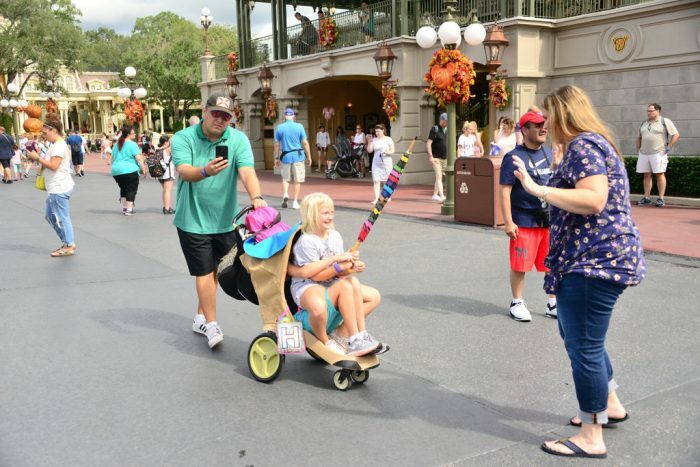 What about parents who are so occupied on their cell phones to either watch or interact with their kids at the parks? Last week I was at a showing of Fantasmic! and encountered the same thing. Now, this not being my first rodeo I had packed a bunch of cheap “glow sticks” for my family to enjoy while we waited for the show to start. Directly in front of us was this girl who was probably 4-6 years old who was just staring at our family enjoying their time. She had her family sitting directly next to her and for the entire time both the man and woman stared at their phones. It was shocking to see. We gave the little girl a glow wand to play with. Granted this was just a snapshot of a person’s life, and maybe these are the greatest parents in the world and there was something incredibly important going on that they both had to be glued to their phones for 30 minutes, but if this is indicative of the time and attention they spend with their child on vacation, what is it like back at home when they have actual responsibilities? I just felt really bad for this little girl. #2 & #3 are the ones that get me the most! People walking and then coming to a dead halt is so frustrating! I’ve decided people lose all since of awareness at Disney. I’ve become really good at avoiding them. And to not do the same thing I am really good at walking while reading a map or taking pictures. And the flash – for everything dark? Do they know they aren’t getting anything good? I’ve purposely ruined those shots for people before if I could. The iPad too, but more in the sense of putting it up in front of people during a show or fireworks. I had a phone in front of me for almost all of Rivers of Light. They sat down right before it started and BAM! I finally was like put it down. I would also add people unaware of their height and or added height with hats and ears. I always remove my ears when I might block someone’s view. I can live without them for length of the show. Tall people baffle me when they keep moving for a view not realizing that shorter people have found a way to see around them but every time they move, they block the view again. I always remind my tall husband to stay in one spot so he’s always aware of those around him. Wow. This is a lot of complaining. Just remember, trashy confrontations about bad behavior ruin a lot too. Witnessed a giant biker type guy go nuts because someone stood up to applaud during Rock Springfield during one of the 15 minute EPCOT shows. So let me get this right. I walk all day in the park and because, I am a man I have to give up my seat. In a world where women fight for equal rights this seems counter productive. Just because you have kids doesn’t give you the right to a seat. If you want equal rights you take the good with the bad. In fairness, a man wrote this article. However, as a woman, I totally agree with you and would never want a man to give up his seat for me. If I was elderly or disabled, sure, but otherwise, I feel like seats are first come, first served. Friday night we were at HHN Hollywood. They have a tunnel where you have to walk to/from the backlot mazes. It’s a really great crowd control measure for such a small park, they have monsters and lights in there as well. On our way back from these mazes some “kids” (to me) decided to start smoking in this tunnel. And I have asthma. I tried to say something to them repeatedly. So instead of stopping, another of them lit up a cigarette and blew it right in my face. I ended up having a full-blown asthma attack. So that’s definitely my biggest pet peeve in the parks, although the flash pics in dark rides (or Halloween Event Mazes) is a VERY close second. I just got back from Disneyland (first trip/switched last minute from our yearly WDW trip). I saw all these things. One thing I noticed more in Disneyland is one person waiting for rope drop for over an hour and then 5-6 people join them a few minutes before we’re let in. Very aggravating. Awesome article. My pet peeve, a variation on the “group stop” gripe, would be the large groups (twenty or more) of Brazilian students who (at least used to) march through the parks, phalanx style, following a tour guide who carried a flag on a pole that must have been ten feet high, with absolutely no regard for anyone walking around them. On one occasion, this included me as I pushed our kids in a stroller, and words were exchanged. What about the people in the theatres who stop and sit wherever they want instead of moving all the way down like the cast members are telling us to do? It drives us crazy! Then you have to awkwardly step over or around them to get to empty seats. The line cutting drives us crazy too. And the people being rude to cast members! It is not the cast member’s fault that a ride breaks down people!!! Another peeve is people with double-wide strollers full of all their “supplies”, with nary a child in sight. In fact, it is clear there never was a child in the stroller, for the simple reason there is no room for a child in the stroller. It’s just there to carry all their crap. My kids have been going to WDW since they were in diapers. My son, now 11, melted my heart when he was around 8 years old. We boarded a Disney bus at closing so of course it was standing room only. He was sitting next to me and while I held his 18 month old sister. Another mom holding her baby got on the bus and my son, without me asking, kindly stood up and told her to sit. He refuses to sit when others have to stand. Only to experience the ride with everyone taking FLASH pictures because the ride is so “new” and seems so “cool”? How about some pet peeves that dont involve other guests? Asking people to “move in” / squeeze in at a show where I’ve waited 2 hours in my spot just so that late arrivers can get in too. How about just having the actual RIGHT AMOUNT of seating and ADDING SHOWS!! We’ve all paid to get into the parks. My only CM pet peeve is the CM who sees me and my Mom (both Pooh-sized) and they decide we can both fit in a spot that would barely hold one regular sized guest. We regularly have to stop them and say, “we won’t fit there” only to get surprised looks. It’s not that hard to see. We were at WDW last December. I did not see any unauthorized smoking at the parks, but there were lots of offenders at the Pop Century. Also, the placing of the smoking areas at the parks, especially EPCOT, seemed to be too near walkways. Before you jump on people not giving up seats. Often people…young and healthy looking, have hidden disabilities that make standing or walking extremely painful. Unless you question them for their disabilities, you’d never know and it’s best to keep your opinions on their legit use of the ECV or siting on a crowded the bus to yourself. The only problem I’ve had with smokers in the parks is the smoking areas seem to be in the middle of walkways, especially at EPCOT, and that is not the smokers’ fault. BUT, at the resorts too many smokers seem to ignore the smoking rules and smoke wherever they want. The people stopping and blocking others’ way is aggravating enough, but when I’m shopping or looking at a display or something like that, and people squeeze in front of you as if you aren’t even there. One of the pet peeves I have that is not listed regards the use of strollers by children who are obviously too old or too big for strollers. I’m not talking about children who have special needs, either. I’m willing to bet quite a few of the children we saw in strollers were 8 years old or older. Ha good ones! I think people who cut in lines and chair hog, smoke anywhere, have no conscience. They deserve the full “new yorker”. But many of the behaviors here may be more a case of not realizing they are affecting others. In the moment i know how irritating that is. Outside of it, anger about say, the family who doesnt know the park layout by heart stopping to look at a map, says more about the childish narcissism of the complainant. No mind blower there just poetic justice. Ban the cutters for life; politely instruct the photo snappers they are ruining your experience. 2nd offense- ban for life! RE: umbrella pet peeve. 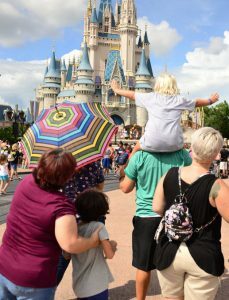 I hear ya, but as someone with recurrent skin cancer, the best way for me to get around in July at the parks is with one of my special UPF umbrellas (yes, there is such a thing). On our last visit, we went to Reflections of China (the 360 degree video about Chinese culture). Some guy was videotaping the show with his phone. How he expected to get a 360 degree show with his phone, I cannot imagine. But, he had the video flash on, and he filmed the whole show. And he was turning around constantly, trying to film the whole screen. So, for everyone else in the theater, there was some jerk with an extremely bright cellphone flashlight shining everyone in the eyes every 30 seconds. The CM came over to ask him to stop, but he just ignored her and kept filming. It would have been nice for the CM to get some backup to actually get the guy to stop; all he had to do was turn off the flash, and he could have taken the same crappy video of the show, and the rest of us could have enjoyed our experience. After the show, someone else in the audience confronted him loudly in the gift shop, and it looked like it might come to blows. We didn’t stick around to see what happened. My biggest pet peeve happened on two separate occasions of people not planning ahead and getting to night parades right before they start and therefore standing right behind me and pushing their children (who were about my height) in front of me. If you want your kids to see a parade plan ahead and get there early. Don’t punish me for your lack of planning. Also we had a group of college kids try to skip an full line of people waiting for a bus because the bus was going to be full and some people where going to have to wait. That was one of the best moments though as everyone realized what they were doing and yelled at them collectively. I’ll never forget their upset faces as they realized their plan wasn’t going to work and they were going to have to wait for the second bus but they should have known better to begin with. Great article! Hilarious pics! Great job!